Can you crack the Codewords code? CodeWords is a puzzle that is great fun, and a good test of your logical abilities in addition to a test of your vocabulary. It combines elements of the standard crossword puzzle with elements from logic and number puzzles which is what makes this puzzle both unusual and particularly good fun to complete. 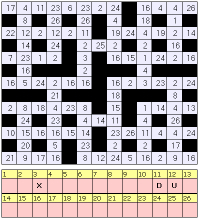 A CodeWords puzzle starts with a grid that looks like a crossword except for one thing: every cell contains a numbers! The numbers range from 1 - 26 and represent one letter each from the alphabet. It may be that the number '2' represents the letter 'S' but that's for you to find out. Usually you will be given a couple of letters to get you started, for instance if you are told that '2' is infact 'S' then your first move is to go through the empty codewords grid and fill in all cells marked '2' with the letter 'S'. No other number will represent the letter 'S'. Once you have marked in the givens you can usually place one or two words straight away. Of course your knowledge of words and language will help you solve the puzzle, together with your experience of playing codewords and your logical thinking. Of course, there are many strategies you can use to help you solve the codewords puzzle. For instance, if you look for the most common letter this is virtually always an 'A' or an 'E'. It often pays to write it in as 'E' and see if it works or if it creates stumbling blocks. Also look for where a letter appears twice as this narrows down considerably what letter that may be. Remember when you find the 'Q' the 'U' should not be far behind - the next cell, in fact. If you have 'I__' at the end of many words, this is often 'ION' or 'ING'. By having a good knowledge of common endings you can accelerate your solving abilities for codewords. Similarly remember 'S' tends to be quite common, both within words and with plurals. \"if the magnitude of a vector component equals zero what is the magnitude of the other vector component?.\"
No comments have been added to this question.